The data rate of a network connection is normally measured in units of bits per second, generally abbreviated as bps instead of b/s. Network equipment manufacturers rate the maximum network bandwidth level their products support using the standard units of Kbps, Mbps, and Gbps. These are sometimes called internet speed units because as network speeds increase, it's easier to express them in thousands (kilo-), millions (mega-) or billions (giga-) of units at once. One kilobit per second equals 1,000 bits per second. This is sometimes written as kbps, Kb/sec or Kb/s but all of them carry the same meaning. One megabit per second equals 1000 Kbps or one million bps. It's also expressed as Mbps, Mb/sec, and Mb/s. 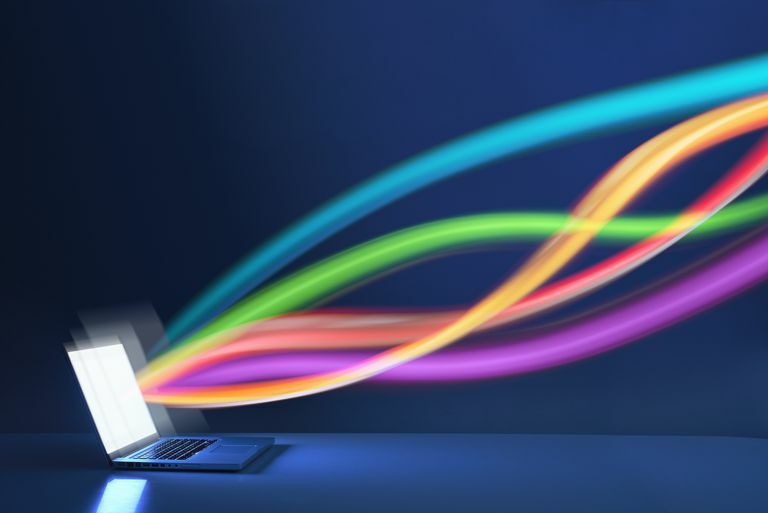 One gigabit per second equals 1000 Mbps, one million Kbps or one billion bps. It's also abbreviated as Gbps, Gb/sec, and Gb/s. For historical reasons, data rates for disk drives and some other non-network computer equipment are sometimes shown in bytes per second (Bps with an uppercase B) rather than bits per second (bps with a lowercase 'b'). To avoid confusion between bits and bytes, networking professionals always refer to network connection speeds in terms of bps (lowercase 'b') ratings. Network gear with Kbps speed ratings tends to be older and low-performance by modern standards. Old dial-up modems supported data rates up to 56 Kbps, for example. Most network equipment features Mbps speed ratings. 1000 Gbps equals 1 terabit per second (Tbps). Few technologies for Tbps speed networking exist today. The Internet2 project has developed Tbps connections to support its experimental network, and some industry companies have also built testbeds and successfully demonstrate Tbps links. Due to the high cost of the equipment and challenges to operating such a network reliably, expect it will be many more years before these speed levels become practical for general use. It's really simple to convert between these units when you know that there are 8 bits in every byte and that kilo, Mega, and Giga mean thousand, million and billion. You can do the calculations yourself manually or use any of a number of online calculators. For example, you can convert Kbps to Mbps with those rules. So 15,000 Kbps = 15 Mbps because there are 1,000 kilobits in each 1 megabit. CheckYourMath is a cool calculator that supports data rate conversions if you want to try them on your own. Can You Achieve 300 Mbps Speeds on an 802.11n Network? How Is Megabit (Mb) Different From Megabyte (MB)?